As some of you may recall, there was an event called 'A Long Expected Party' held in Kentucky a couple of years ago (old thread) Well, they're at it again! There and Back Again will be held at the Shaker Village near Lexington, Kentucky. Food and lodging are provided by the staff of Shaker Village, so you must register for the event as well as book rooms. Cost: $350/person (discount for children under 12) includes food and all events (though not accommodations). Day passes are also available for anyone who is local(-ish). It's an opportunity for Tolkien fans to get together and celebrate their love of these stories and enjoy one another's company. The setting of Shaker Village is rural, so much more amenable to such an undertaking than a hotel in an urban environment. [Shuttle from the local airport is provided.] There's a boat ride on the river, talks by guests, music and entertainment in the evenings, etc. There's lots of chances to wear costumes if you want to, but *everyone* will wear costumes at the Saturday night party. There are probably over 1000 pictures up in the old thread, if you're curious. 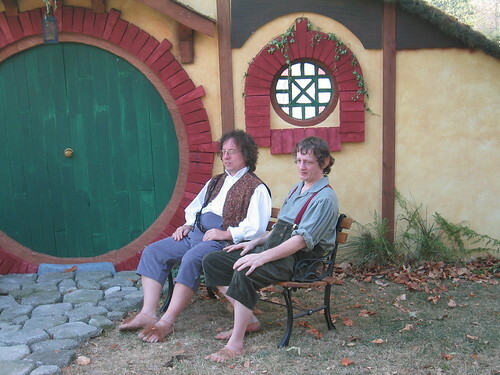 The people who are organizing this (Bilbo and Gandalf) have a great attention to detail as their website might suggest, and having already organized this event once, they know what they are doing. It is a blast, but it turns out Shaker Village can only accommodate so many people. So, if you are interested and know you can make, you might want to consider putting down a deposit to reserve your spot. I have no idea what my plans are for 2011, but if I can possibly attend this, I will! I remember seeing your photos, they were absolutely amazing. Mith, do you have any idea how far in advance a person needs to book this? A year & 1/2 away is too far for me to schedule at this point! I'll bookmark the page but keep us informed! I believe the intention is to sell registrations until September 15, 2011 (no registration at the door). But the venue isn't going to house/support 300 guests, so once they sell out...there's not really any opportunity to go. I'm not sure when that will happen, but I imagine most of the people who went last time will wish to return, and so they will likely sell out well before Sept. 2011. Certainly, most people don't know what they're doing a year and a half from now, so I'd say bookmarking the page and waiting is okay for now. But I wanted to put the notice here sooner rather than later! Update: 100 registrations have already been sold. Most of these are likely people who attended the last one. So, if you know you can make it...act sooner rather than delay; this event is likely to sell out well in advance. Just thought I'd stop by and post some more details. Some Events that will be taking place during There and Back Again. Some are repeats from last time, and some are new. Also, an update on the Rooms Available - anything marked in red is taken, so as you can see, quite a bit of the Village is already booked. The accommodations are simple (this is a Shaker village!) but quite comfortable and nice. You can go to Inn at Shaker Villate for more information, but you have to book through the TABA website, since the entire place is reserved for them. I hope some of you are able to attend! It's a wonderful event . Mith.. I recall looking at your photos.. and it was amazing, but it's been awhile. 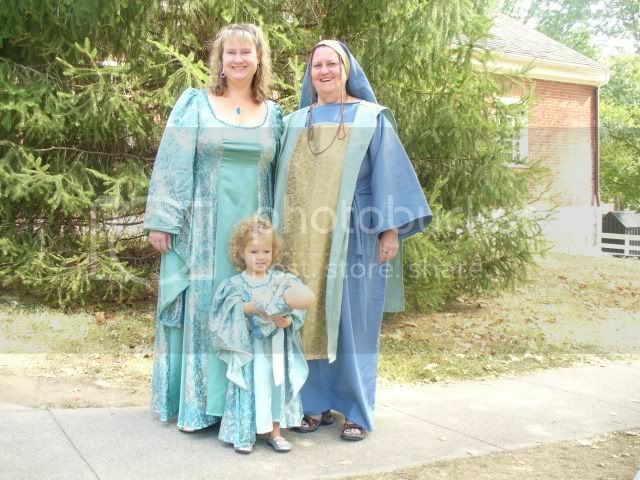 Would you say that people of all ages attended? I would love to go to something like this.. but it's a bit far away for our planning yet. Last edited by MithLuin on Tue Aug 10, 2010 3:48 pm, edited 1 time in total. OHMYGOODNESS!! The costumes are amazing! 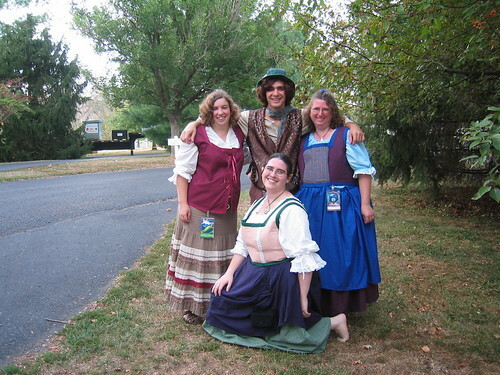 I have a 'hobbit lass' costume.. but.. hmm... maybe I'd have to make a new one... It does seem like SO much fun. The 'authentic' type thing that would be right up my alley. I like that it is a family type event. I think there are a few spots left, so if anyone would like to come....please register ASAP!! There will be fellowship and music and dancing and skits and costumes and walks in the woods and games and boat rides and yummy food and time to relax and...well...whatever you want! I'll be there with two other TORCers and I know there will be two more there that are part of our Middle Aged and Crazy group. It was WONDERFUL in 2008 and I'm really looking forward to it! I looks like THE event of the year. Can't wait! WELL, that's it, it's the last day for registration...and I think the spaces are full. Now, to do a lot of costuming work in the next two weeks! Hands down, the best Moot EVER!!! I agree! There's nothing like it. What were the names used by our TORC attendees there? I probably saw you and maybe spoke with you, but didn't recognize you!! This was my second time and I know I will go again. I sang in the Hobbit choir and answered to McIntyre in the Old Dun Cow song. Easy to spot me out. White guy with a black wife. Yes, it was great to meet you this weekend! 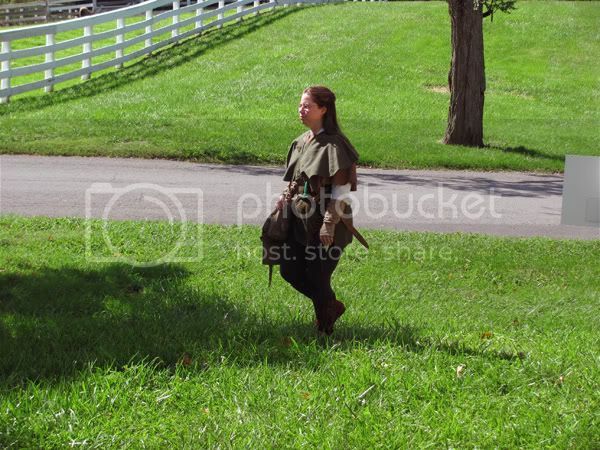 I was in the line dance (aka Secret Hobbit Dance) with you guys . First, the showing off of my costumes. I had a ton of fun doing that, of course! Curufin, Son of Feanor...not killing someone...but definitely thinking about it! An ent? said Merry. What's that? In this case, it is an attempt at disguising myself as a sycamore tree. I'll have to make some improvements if I do this again! But I've wanted to make an ent costume ever since I saw the musical botch them horribly as ZZ Top on stilts. Woman of Rohan. Yes, that's a hakama. Hey, it's basically a skirt that you can ride horses in, so it fits, right? Very little of this outfit is made by me. And Shaker Village rooms conveniently have pegs to make switching between all these costumes (relatively) easy. So, what else did I do all weekend other than wear silly costumes? Well, we went on a hike. That involved fording streams. And pose for silly shots. ...with about 100 great friends! Thanks so much to JP and Tim (the organizers) and their many helpers that made this so memorable and worthwhile. If you live in Phoenix, AZ, you may see them on the morning news tomorrow! I can't wait for AL3P: The Road Goes Ever On!!! Last edited by MithLuin on Wed Oct 05, 2011 9:19 pm, edited 2 times in total. Great photos! I just sent you a Facebook friend request. My wife and I plan on going to the next event. Loved the one with all of your costumes on the pegs. We were wondering what they were for. Now we know that the Shakers were planning on us being there all along! Shakers have no closets. Shakers need no closets. And yes, those are my roommate's costumes hanging there. Mine were across the room . I keep dreaming about being back there! There's a photobucket and facebook page full of photos; these were pilfered from there. I don't even have a camera! But if anyone is interested in an actual write-up of what I did, check out my livejournal post. And for a list of what made it awesome, check out mellymell's. I have a lot more facebook friends now than I did a week ago! My room had a closet. Really? They were unusual in 1800s architecture, so I wonder if that was original or added later. Here's the website for Shaker Village for anyone who's interested in site where this was held. 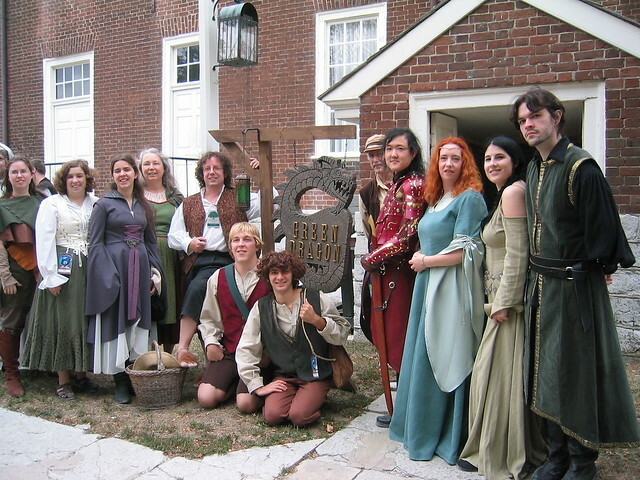 And another blog entry by Lady Celebrian, a local: A Piece of Middle Earth: To the Shire! Mellymell's post on livejournal is also a good account of why it was so much fun. It reads like a list of inside jokes, but should still be amusing even if you weren't there. The videos are starting to pop up on YouTube now. I posted the elf choir singing two songs above from Thursday night. 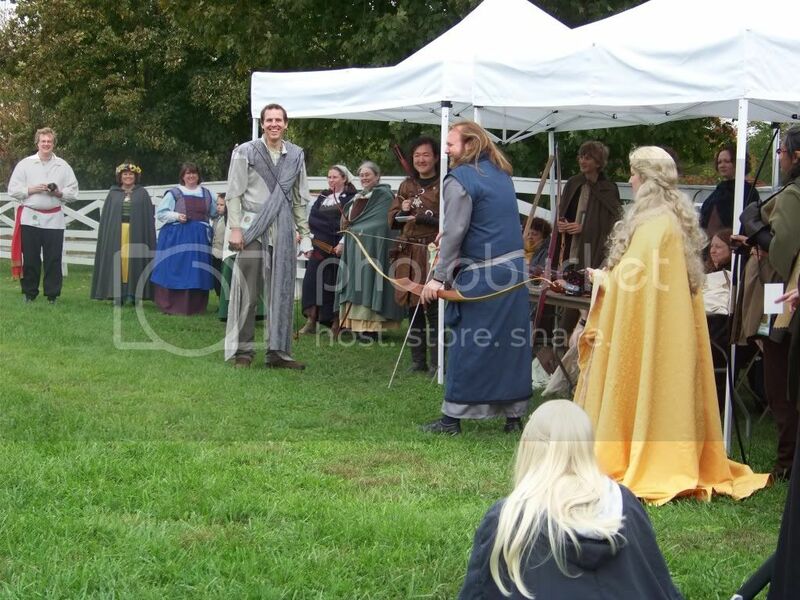 That same evening, we had some amusing skits: The Council of Elrond and The Mines of Moria (only part). Here is the artist Jef Murray reciting 'Earendil the Mariner' to Gregorian chant, with 'A Elbereth Gilthoniel' at the end. The first two minutes of the video are just the introduction, where he explains a bit about who Earendil is, before he begins chanting at 2:13. The poem is very long of course, and runs to 9:25. 'A Elbereth Gilthoniel' begins at 10:20. Enjoy! I might add more later. As promised...it's later, and here are some more links. These are all YouTube videos. Storytelling at Bag End It was a bit cold to be doing this out of doors! Into the West and of course we all joined in on this one to finish off the night. Perhaps next time there'll be an Uru-choir for those of us who can't sing! Bilbo wrote: let me put this out there.. tell anyone everyone if they are not on my email list to send me an email to bilbo_alep@yahoo.com and request to be put on the list for this and any future events. Information to/from there will be the official info. The 'this' mentioned in this message is a get-together on the weekend of the release of The Hobbit movie (in Dec. 2012). It won't be a full-blown event like ALEP or ALEP2 (no programming or events), simply a group of people getting together to watch the movie and then hang out and talk about it that weekend. So, if anyone is interested in watching the movie and spending some time in fellowship with other fans in Lexington, KY...shoot him an e-mail! All are welcome. Or, one could rely on me to update you as to when the next event will be, but....that might not be the wisest course of action. I'm moving to Ethiopia in 2 weeks, so...probably will neglect to do that. This will be happening on Sept. 24-28, 2014, so you have one year to consider if you'd like to attend. However, it's more or less booked at this point, so I think you might have to room off site, buy day passes, and find your own food. It is possible to contact the organizers and get yourself on a waiting list, as well (in case anyone who is currently signed up has to bail out some time over the next year).